Episode Review: LEVERAGE, "The Office Job"
I don't know what to say about "The Office Job" because it was an episode that had a lot going on, but nothing really happened when it was all said and done. It was still a lot of fun to watch, but it didn't give me any additional insight into story that Leverage is trying to tell. The episode kicked off in the office of a greeting card company where some guy was being fired, and so he went to Nate to get help proving that his boss has been up to some shady business that could jeopardize a buyout that could save the town. The Crew decided to pose as efficiency consultants in order to figure out what was going on, but there was a catch. A documentary film crew was also on the scene to make a film about small business in America, hence the episode title and all of the Office riffs. Once inside, the Crew uncovered a plot that didn't have to do with embezzling money but counterfeiting it, and it was all a set-up by the head of HR to oust the CEO who had been the albatross around the company's neck. That was pretty much it in terms of plot. 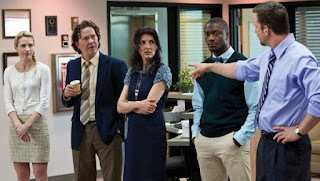 While "The Office Job" was pretty straightforward from a narrative stand-point, and it didn't add much to the overall arcs, it was a pretty decent character-driven one that highlighted how some of the members of the Leverage Crew relate to one another. Eliot and Hardison's relationship has evolved from one that was strained to one of the better bromances on TV, but they still have some trust issues to work out which was brought to light because of a sandwich. Since this was an episode that focused on the relationships of the group, it of course had to touch on the continued "will they, won't they" between Nate and Sophie. Now, I've never been a huge fan of this pairing (mostly because it was so blatant from the get-go and not as sweet as Pardison), so I'm glad that the ramifications of what happened at the end of "San Lorenzo" haven't dominated this season. Even this time around, I didn't mind the fabricated tension between Nate and Sophie because the writers have not been beating me over the head with it, so I was all for some forward movement involving these two. I still don't think I'll really care all that much about Nate and Sophie as a couple, but at least their tiff added to the enjoyment of the episode instead of hurting it. That really looked like The Office office. Good job by the set designers. Great stuff from Parker as always. Her berating the card writers for being to positive was gold, and her aversion to cameras was not only funny, but a logical character trait. And the German's obsession wither her, could you blame him? The "F--- This" card running gag ran the risk of being overused, but it was utilized perfectly. To Eliot's credit, that did sound like one tasty sandwich. So when did the German become a part of the team? I guess they needed him for his footage. "She was a bit too trusting." "I'm allergic to tryptophan. ""Two dinosaurs falling in love? It makes no sense. How about a dinosaur ripping the head of a lion?" "How do eat another man's sandwich? It's the code of the West." "Don't tell anybody I got beat up by an efficiency expert." "Nobody throws Hardison off a roof. Except maybe me. HA HA HA! No..."
So, "The Office Job," much like last week's episode, didn't build off of the season long arc, but that's not necessarily a bad thing. It was still an enjoyable installment that expanded on how these people relate to one another, and that's just as important as telling an over-arching story, so I can't complain.